"The Memo" is capturing the news today, because it's coming it's imminent. By the time you read this, it may have already been released today, but if not...soon. "The Memo" is a distilling, a reducing of thousands of pages of documents reluctantly provided to the House Intelligent Committee by the DOJ and the FBI. The mainstream press is on full attack even before "The Memo" is made public. That, in itself, is very revealing. Rep. Trey Gowdy, who is on the committee, has read it, and he says the Left should be worried. NBC is reporting that the House Intelligence Committee voted Monday "along party lines" to "make public a classified memo about some of the government's most sensitive secrets." 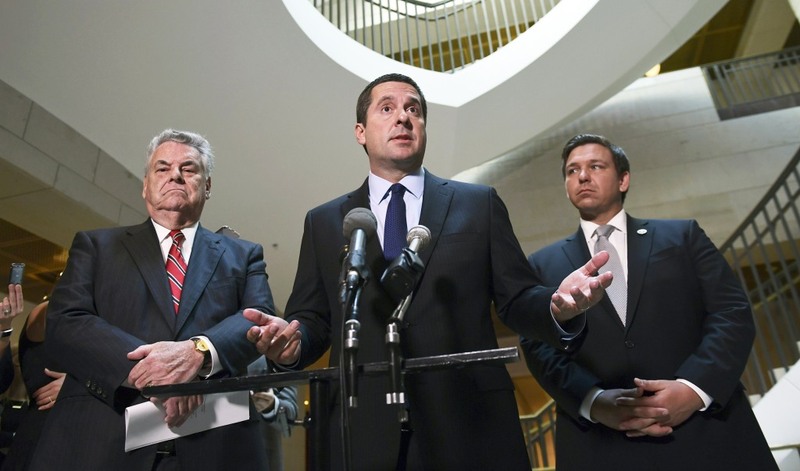 They, along with most other mainstream news organizations, are trying to do damage control before the memo is made public---accusing Republicans of simply trying to undermine Mueller's investigation into the Trump Administration. They quote Rep. Adam Schiff, D-Calif., the top Democrat on the House Intelligence Committee, saying the vote to publicize the memo is a "sad day in the history of the committee." Well, it depends which side of history you find yourself on, and certainly which side of this issue you fall. It's obvious that the Left already know they are on the wrong side of the truth. On Sunday, the day before NBC published their article, Rep. Trey Gowdy, R-SC, was on Fox News pushing for the memo to be released. The vote to release took place the following day---Monday of this week. Gowdy said the memo "is a distilling, reducing thousands of pages of documents provided to us by the [DOJ and FBI]. So there is nothing in this memo that the Bureau is not already aware of." And therein lies the problem for the Left. In regard to the now infamous and discredited "Russian Dossier," Gowdy said, "If you think your viewers want to know whether or not the dossier was used in court proceedings, whether or not it was vetted before it was used, whether or not it's ever been vetted, you will find out." He said, "If you are interested in who paid for the dossier, if you are interested in Christopher Steele's relationship with Hillary Clinton and the Democratic National Committee, then, yes, you will want the memo to come out." Gowdy said, "If you are Adam Schiff, who is consistently wrong when it comes to issues of disclosure. He didn't want us to find out any of this information. He fought---in fact, Fusion GPS went to court to keep us from finding out the Democrats paid for the dossier. If you are Adam Schiff, of course, you don't want the information to come out. You didn't want us to find it in the first place." He continued, "Are you interested in whether or not the world's premier law enforcement agency relied on a work product produced and paid for by the Democratic National Committee"---is that "significant enough for the American people to know?" And, "Do you want to know whether or not the primary source in these court proceedings had a bias against one candidate? Do you want to know whether he said he'd 'do anything' to keep that candidate from being elected president?" The House Committee believed Americans do, in fact, want to know. They voted Monday to release the memo. The president has strongly indicated he, too, thinks we the people should know, so it isn't likely he will halt the release of the memo. Apparently, some in the bureau who already know, are already running for cover. FBI Deputy Director Andrew McCabe has already announced he is leaving his job early. Ahead of his planned retirement. "The Memo" is the motivator. McCabe is known to be no friend of Trump. His credibility has been questioned even before "The Memo." It has already been revealed that McCabe's wife had accepted campaign contributions from a political action committee of Virginia Governor Terry McAuliffe, a close Hillary ally, during her failed run for a state Senate seat. Soon the light will be turned on, and the truth will be revealed---the results may be seismic. It seems that everything that can be shaken, is being shaken. It is He who changes the times and the epochs; He removes kings and establishes kings; He gives wisdom to wise men And knowledge to men of understanding. It is He who reveals the profound and hidden things; He knows what is in the darkness, And the light dwells with Him. It is also written--"You shall know the Truth and the Truth shall set you free." Be Informed. Be Encouraged. Be Hopeful. Be Prayerful. Be Blessed. Be Free. 1. to selectively filter information to present a one sided false narrative by purposely excluding evidence that disproves your desired conclusion. It is time for the truth to be revealed. Americans deserve to know what is real. That would be nice, However, it would require seeing the information from both sides and the supporting documentation. Unfortunately, the Republicans voted to suppress the Democrats from releasing any information they had on this. So much for transparency.